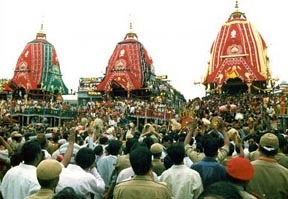 4 July:The world famous chariot festival, Rath Yatra is being celebrated with thousands of devotees thronging at Puri Jagannath Temple to pull the three huge chariots carrying the Hindu Lords. The festival falls on the second day of the bright fortnight of the Hindu month of Ashadha. On this day, thousands of people will pull the three huge chariots carrying Lord Jagannath, Balabhadra and Subhadra through the grand road of the city to the Gundicha Temple. The three deities will enter the temple of their aunt on Saturday, and stay there for seven days. After the week-long stay, the three deities will return on the 12th of the month. This return journey is known as Bahuda Yatra. The 131st Rathyatra of Lord Jagannath is also being held in Ahmedabad on Friday. This is one of the oldest in Gujarat and begins from Jamalpur. There are three separate chariots for the idols of Krishna, Balram and their sister Subhadra and all are colourfully adorned.